In the last Blog we have seen an impressive list of abilities, which guide animals must have to properly do their job – and we now know that talented horses and ponies can pass the test of such a learning programme expertly. So let’s look at the components, factors and conditions which such learning entails. Horses have long been taken for stupid by many people, often because humans mostly assess the horse’s understanding relative to riding tasks – and as we already know, riding, i.e. carrying somebody on his back, is a very unnatural activity which really goes against a horse’s instincts. 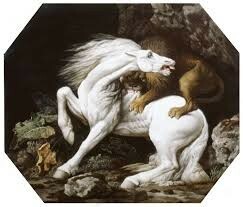 (In the wild a horse only carries the cat, which is about to eat him). Im Letzten Blog haben wir eine beeindruckende Liste der Fähigkeiten gesehen, die ein Blindenführer haben muß, um seinen Job gut auszuüben – und wir wissen nun, daß talentierte Pferde und Ponies diesen Test blendend bestehen können. Sehen wir uns also an, was für Komponente, Faktoren und Bedingungen solches Lernen beinhaltet. Pferde wurden lange von vielen Menschen für dumm gehalten, meistens, weil ihr Verstand im Zusammenhang mit Reitaufgaben bewertet wurde – und wir wissen ja schon, daß Reiten, d.h. etwas auf dem Rücken tragen, für das Pferd eine Aktivität ist, die wirklich gegen seine Instinkte geht. (In der Natur trägt ein Pferd nur die Wildkatze, die es gerade fressen will). In nature, the horse never carries anything on his back, except the cat which is just going to eat him. For the horse it only pays to be clever in things, which are beneficial for its own survival. He has genetic dispositions and mental equipment to help reach this goal, partly inherited and partly learned – but also influenced by environmental factors, such as favorable conditions for feeding and social contacts. One thing is clear: the above mentioned factors are all inter-connected: they can’t be separated and analyzed individually. A constant cross-influence of all of them determines the outcome. 2) confined range of motion (which most of our horses experience). 3) an unstable social environment, such as constant change in human owners, the structure of the herd, or frequent separation from friends, which creates a feeling of great insecurity. Such disharmony and stress hamper the development of the horse’s intelligence and therefore the learning process. “Horse-logic”: I think, therefore I am a horse! Above all we must realize that a horse thinks like a horse and not like a human. It has a very specific “horse-intelligence”, which has proven useful and fitting for its own living conditions and survival. Their repertoire of behaviour is adapted to the respective surroundings and living conditions – meaning that you can’t compare the way a desert horse looks for water to the way an Iceland pony tests an icefield – their learning experiences are completely different. Also, other “intelligence tests”, such as the famous mirror-test, used to determine whether an animal possesses self-awareness or not, might simply not be appropriate for horses, perhaps because for them smell might be more important for identification of a living being than outward appearance. There is so much we don’t know yet. Für das Pferd zahlt sich nur aus in solchen Dingen clever zu sein, die aussichtsreich für sein Überleben sind. Es hat genetische Anlagen und eine mentale Ausrüstung, die ihm helfen, ebendas zu erreichen. Die sind teils vererbt, teils erlernt, aber auch durch Umweltfaktoren beeinflußt, wie z.B. günstige Lebensbedingungen und soziale Kontakte. Eins ist klar: die oben erwähnten Faktoren sind alle miteinander verkettet und können nicht getrennt und einzeln analysiert werden. Es ist die ständige gegenseitige Beeinflussung, die das Ergebnis bestimmt. 3) ein instabiles soziales Umfeld, wie ständiger Wechsel des Besitzers, ständige Änderung in der Herdenzusammensetzung, häufige Trennung von Freunden etc, was große Verunsicherung hervorruft. Solche Disharmonie und Streß behindern die Entwicklung der Intelligenz eines Pferdes und daher die Lernprozesse. „Pferde-Logik“: Ich denke, daher bin ich ein Pferd! Vor allem müssen wir erkennen, daß ein Pferd eben wie ein Pferd denkt und nicht wie ein Mensch. Es hat eine ganz spezifische „Pferde-Intelligenz“, die sich als nützlich und für seine Lebensbedingungen und sein Überleben passend erwiesen hat. Sein Verhaltensrepertoire ist an die jeweilige Umwelt und die damit einhergehenden Lebensbedingungen angepaßt. So kann man nicht vergleichen, wie ein Wüstenpferd nach Wasser sucht mit dem Verhalten, wie ein Islandpony ein Eisfeld testet – die Lernerfahrungen der Beiden sind total unterschiedlich. Auch andere „Intelligenztests“, wie z.B. der Spiegeltest, der dazu verwendet wird zu bestimmen, ob ein Tier Selbsterkenntnis besitzt, mag auf Pferde einfach nicht zutreffen – vielleicht ist es für sie für die Identifikation eines anderen Lebewesens wichtiger den Geruch zu erkennen anstatt das Aussehen. Es gibt so viel, was wir noch nicht wissen. Beau greets his friend daily – only in this mirror! What does he see or recognize? Beau begrüßt täglich seinen Freund – immer nur in diesem Spiegel! Was sieht oder erkennt er? 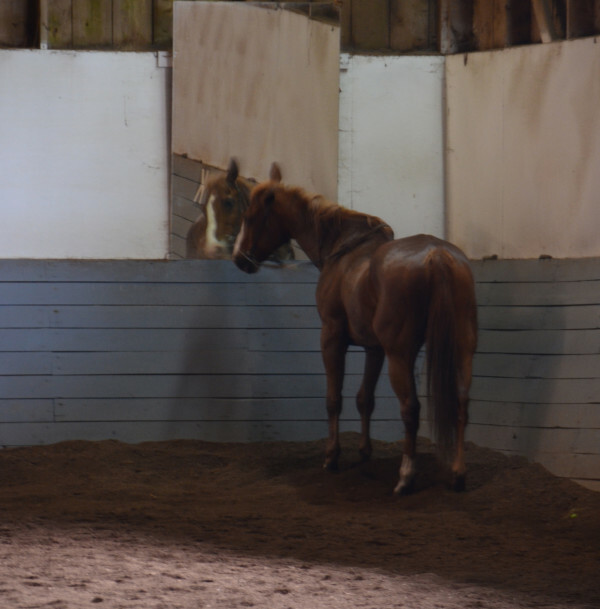 We can scientifically only prove what we can repeat in experiments, and often the problem lies in setting up such tests for horses – as for example in the above mentioned mirror test. How to give the horse a “mirror-smell”, in case that is the determining factor for the recognition? But there can be absolutely NO doubt that horses think! Cognition is the ability to perceive, to realize and to understand their world and what happens around them. What do horses understand of the physical laws of nature? Can they remember connections between events? Can they realize cause and effect? Can they assess and judge incidents? How do they see other horses, how themselves – and us? In the US, the Equine Research Foundation of Horse Learning and Behavior has done extensive clinical research on horse intelligence. Their scientists have proved the theorem that “a horse’s ability to learn is directly proportional to their prior learning”. That means, the more a horse learns, the greater his capacity for future learning. That is why we play! Wir können wissenschaftlich nur beweisen was wir in Experimenten wiederholen können, und oft liegt die Schwierigkeit im Versuchsaufbau für Pferde – wie im oben erwähnten Spiegeltest. Wie einem Pferd einen „Geruchsspiegel“ vorhalten, falls das der springende Punkt für das Erkennen ist? Dennoch kann es absolut keinen Zweifel geben, daß ein Pferd denkt! Kognition ist die Fähigkeit ihre Welt zu erkennen, wahrzunehmen, was um sie herum geschieht und diese Welt zu verstehen. Was versteht ein Pferd von den Naturgesetzen? Können Pferde die Zusammenhänge zwischen Vorfällen herstellen? Können sie Ursache und Wirkung begreifen? Können sie Ereignisse einschätzen und werten? Wie sehen sie sich, andere Pferde – und uns? Die Equine Research Foundation of Horse Learning and Behavior in den Staaten hat umfassende Studien über die Intelligenz der Pferde betrieben. Ihre Wissenschaftler haben das Theorem bewiesen, daß „die Lernfähigkeit eines Pferdes direkt proportional zu seinem früheren Lernen“ ist. Das heißt, je mehr ein Pferd lernt, desto größer ist seine Leistungsfähigjkeit für weiteres Lernen. Read and view how it is done! Giving your horse a full and active life, which does not only satisfy his physical needs, but also allows him to use his own head, to live out his own personality and fully develop his mental capacities, gives him a kick-start into a life of learning. Wenn man seinem Pferd ein volles und aktives Leben ermöglicht, das nicht nur seine körperlichen Bedürfnisse erfüllt, sondern ihm auch erlaubt, seinen eignen Kopf zu benützen, seine eigne Persönlichkeit auszuleben und seine geistigen Fähigkeiten voll zu entwickeln, dann gibt ihm das einen fantastischen Einstieg in ein Leben des Lernens. The test-person has to play along! And that may be part of the problem: horses only play along when they are motivated. Motivation means having the impulse to try – and here all those factors come into play, which the horse sets as his present priorities for the fulfillment of his physical and emotional needs. These are inter-connected and can change from one moment to the next. For example, to satisfy his feeling of “hunger”, the horse does not only need a specific amount of pellets, but rather also the activity of wandering and searching for food and a certain amount of chewing activity. Only if he gets all of it, the need is truly satisfied. So motivation is not something we can observe from the outside – it is the assumption that a horse has a certain drive to choose either to satisfy his short-term needs or to go after a more long-term goal. All living beings try to satisfy a felt inner need as immediately as possible and show behaviour leading to that goal. This is called the “appetitive” phase, meaning that the horse is looking for a solution, engaged in an activity which promises satisfaction. Once this is achieved, for example he has found a saltlick, the motivation to search will of course decrease, and it is unlikely that the same “searching behaviour” will be shown in the near future. He is then free to turn to other activities. If the “appetitive phase” however is long-lasting, meaning that the horse is unsuccessful in fulfilling his needs in a timely manner, then the deficiency is more keenly felt and it becomes almost impossible for him to concentrate on anything else instead. You remember from other Blogs that I always suggest to go grazing with your horse for a while before you work (instead of after as a reward, which is human thinking and not logical to the horse) for exactly this reason: once the physical need of grazing is satisfied, your horse will be able to concentrate fully on the following task at hand. Modern science is interested in the intellectual capabilities which a horse will show of his own free will, in a playful mood and reinforced with rewards. Personal initiative and creativity can therefore only blossom, when all other needs are previously fulfilled – and when this is not the case the horse will not show his real cognition, but rather his like or dislike to the test. When you give your horse the opportunity to show you all the things he is talented for, in fields that are important for him, and allow him to do this in his own way, then very different areas of intelligence come to light. This interesting path is what we shall attempt to embark on. Aber der Proband muß mitmachen! Und das ist vielleicht ein Teil des Problems: Pferde machen nur mit, wenn sie motiviert sind. Motivation bedeutet, den Impuls zu haben etwas zu probieren – und hier kommen eben alle die Faktoren ins Spiel, die das Pferd für die Erfüllung seiner momentanen körperlichen und seelischen Bedürfnisse als momentane Priorität setzt. Diese hängen miteinander zusammen und können sich auch von einem Augenblick zum nächsten ändern. Z.B. ist es nicht genug, wenn das Pferd „Hunger“ empfindet, ihm einfach eine gewisse Menge Pellets zu verabreichen, sondern es braucht auch das zum Fressen gehörende Herumwandern und Suchen, und eine gewisse Anzahl Kauschläge – nur wenn es das alles hat, wird sein Bedürfnis wirklich gestillt. Motivation ist also nicht etwas, das man von außen beobachten kann – es ist die Annahme, daß ein Pferd eine Bereitschaft hat, entweder seine jetzigen Bedürfnisse zu befriedigen oder mehr langfristige Ziele anzusteuern. Alle Lebewesen wollen ihre Bedürfnisse so zeitnah wie möglich erfüllen und zeigen daher entsprechendes Verhalten. Das bezeichnet man als „appetitive Phase“, d.h. daß das Pferd mit einer Handlung nach einer Lösung sucht, die hier Erfolg verspricht. Wenn der erreicht ist, z.B. wenn das Pferd seine Salzleckstelle gefunden hat, dann wird die Motivation zum Suchen natürlich abnehmen und es ist anzunehmen, daß man dasselbe Suchverhalten nicht so schnell wieder beobachten wird. Das Pferd kann sich nun anderen Aktivitäten zuwenden. Wenn die „appetitive Phase“ zu lange anhält, d.h. wenn das Pferd erfolglos ist in dem Bestreben seine Bedürfnisse zeitnah zu befriedigen, dann wird der Mangel stärker empfunden und es wird ihm fast unmöglich, sich noch auf etwas anderes zu konzentrieren. Sie erinnern sich von anderen Blogs, daß ich immer empfehle, vor der Arbeit mit Ihrem Pferd ein wenig grasen zu gehen (anstatt hinterher als Belohnung, was menschliches Denken und dem Pferd nicht logisch ist) – genau aus diesem Grund: wenn das körperliche Bedürfnis des Grasens erfüllt ist, kann sich Ihr Pferd viel besser auf die folgende Arbeit konzentrieren. Die moderne Wissenschaft ist daran interessiert, die intellektuellen Fähigkeiten des Pferdes zu erforschen, die es aus freiem Willen, mit spielerischem Aufbau und in Begleitung von Belohnung zeigt. Persönliche Initiative und Kreativität can also nur gedeihen, wenn alle anderen Bedürfnisse vorher erfüllt wurden – und wenn das nicht der Fall ist, wird das Pferd nicht eigentlich seine Kognition zeigen, sondern eher nur seine Neigung oder Abneigung gegen den Test. Wenn man seinem Pferd also die Möglichkeit gibt, wirklich all die Dinge zu zeigen, wofür es talentiert ist, in Bereichen, die ihm wichtig sind, und wenn man ihm erlaubt, das auf seine Weise zu tun, dann wird man erstaunt sein, was für ganz verschiedene intelligente Lösungen zu Tage kommen. Auf diesen interessanten Pfad wollen wir uns nun begeben. This entry was posted in Horse IQ and tagged cognition, intelligence tests for horses, Intelligenz Ihres Pferdes, Intelligenztests für Pferde, Kognition, Your horse's intelligence. Bookmark the permalink.